All opinions aside from their sexist toys and their stupid franchise tie-ins, Lego occasionally does the brilliant. 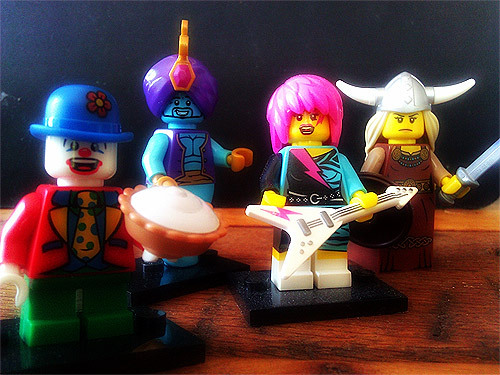 Their minifigures are so iconic, and so ripe for character exploration, that it’s surprising it took decades to move away from the plain Have a Nice Day smiley face the kids of the ’80s remember so well. The minifigure series they launched awhile ago has some misses, but overall the characters are totally sweet and give real personality to the house brand. They’re fun, and my kids like playing with them. That is, they would if I let them. The Friends sets are some of the most well-designed in Lego history. If anything is sexist, it’s that the boys get pretty weak designs. Well-designed how? Through brick patterns? Show me one thing on this page that hasn’t been done by Barbie. When I say that Lego is marketing sexist toys, I mean that both ways. The whole superhero/Ninjago/Bionicle stuff is so testosterone-fueled that the company had no choice but to equalize with the timid, pink, flowery, cute “Friends”. We’re a huge Lego family. Both my son and daughter actively engage in play. But aside from the (very) occasional Star Wars set, all sets we get are gender-neutral town stuff. I won’t buy Friends for the same reason I won’t buy Ninjago for the same reason I won’t buy toy guns or Barbie sets. Previous: When You Say "Curate", I Hear "Punch Me in the Throat"